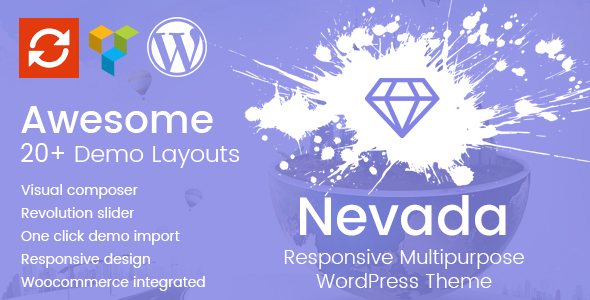 Nevada is responsive multipurpose WordPress theme. It is clean, got the newest design, super flexible, responsive, working with the awesome Visual Composer and created with a powerful admin options panel ! Using the multiple style of Nevada you will be able to create any kind of website, the possibilities are endless ! We have our own support forum if you have any questions or problem, the theme also comes with lifetime updates and we are trying to keep adding new thing in every update. Nevada is super intuitive to use and really user friendly, Nevada include Visual Composer so you wonâ€™t need to code anything, we can asure you that even if you donâ€™t know nothing about coding you will be able to create awesome websites. Nevada comes with a lots of awesome features, weâ€™ve highlighted some of our main features below, check them to get an idea of how awesome Nevada is. Nevada include design that can be used for any type of website: business, corporate, portfolio, blog, products, magazine, etc. Buy Nevada and join our awesome community, letâ€™s make Nevada better together! Includes Icons Fonts,Â more than 5000Â retina ready icons included! Full Color Customizations â€“ change every element with ease including all Visual Composer Modules. Nevada only parent page breadcrumbs options.